It’s time to stock up the first aid kit to prepare for the winter sniffles, and this week we have a great offer on one of our best-selling chicken health products. Nettex Fast-Acting Poultry Nutri Drops are brilliant at perking up poorly, tired or weak hens. In fact, they work like magic, transforming sluggish hens within just 30 minutes. It is a unique supplement that carries nutrients directly into the bloodstream immediately, providing a really fast-acting effect. 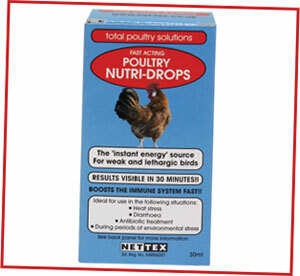 This week get £3.00 off Nettex Poultry Nutri-Drops! Buy them for just £9.59, usual price £12.59. This week buy Poultry Nutri-Drops for just £9.59!